Tylerites who insist the name isn’t a problem ask why no one raised this issue before. They question the need for this debate nearly sixty years after the school was founded, and some say the issue is being driven by “outside agitators.” A look at local history shows this is, in fact, not the first time Tylerites mounted opposition to the school’s name. Before and after Robert E. Lee High School was desegregated in 1970, black students and parents registered serious concerns with the school board and elsewhere about the school’s name. Nothing was done in response. I dug into the files of the late William Wayne Justice, the legendary Tyler federal judge who, in the early ‘70s, forced Texas public schools to desegregate and triggered the removal of Confederate symbols from Lee’s school grounds. I wanted to piece together what happened the last time the school’s name was publicly called into question. Judge Justice’s papers, housed at the University of Texas law school’s Tarleton Library in Austin, offer insights into how white leaders in Tyler fought or resisted desegregation in the wake of Brown v. Board of Education, the landmark 1954 Supreme Court ruling that declared segregated schools unconstitutional. Tyler’s white-dominated school board resisted such pushback for years, appealing Judge Justice’s rulings and ignoring pleas for change. The records I’ve found indicate that, more than once, board members offered no response when delegations of black parents and students came to board meetings seeking a change in Lee’s name and Confederate symbols. White school board members also used clashes between white and black students at Lee to deny black students’ requests, placing blame for unrest entirely on black students. On many of these issues, the black community eventually stopped asking. But the name and what it symbolizes to Tyler’s black community still gall. That was clearly evidenced by the number of black community members and leaders who showed up at last month’s meeting. Many of them told me they weren’t there to speak, but to witness whether this school board would be willing to retire the name and give black Tylerites the consideration their predecessors had been denied. After Brown v. Board of Education, the Tyler Independent School District inched along on the question of desegregation, delaying the process with long negotiations and slow-moving “freedom-of-choice” plans that allowed, but did not encourage, some students to attend schools outside their own, tightly segregated attendance zones. In the summer of 1970, Judge Justice ordered immediate and total integration of Tyler schools. In a devastating blow to black Tyler, the board fought to shut down all-black Emmett Scott High School, rather than integrate it, and won. Two weeks before Tyler’s first integrated classes would assemble and begin the 1970 school year, the school board ignored pleas from the black community to change the name of Robert E. Lee High School. More than 400 people crowded into the boardroom for that meeting, and loudspeakers broadcast to more outside as a lawyer presented a petition from 500 black Tylerites. The signers wanted a promise of fair treatment for all students, black and white. When the lawyer was finished, a white school board member moved to keep Lee’s name “unchanged for the present time.” Other board members asked for a delay in any vote, and the discussion was over. On Aug. 31, nearly 300 black students arrived at Lee for the start of the school year, and twice that many enrolled at John Tyler. At Lee, the band still played ‘Dixie.’ Confederate flags fluttered on school grounds. Lee’s Rebels, black and white, ran out on the football field beneath a massive stars-and-bars flag, the pride of all-white Lee since 1963 and billed as the world’s second largest Confederate flag. In the spring of 1971, attention shifted to newly integrated John Tyler as unrest there dominated local headlines. At least 250 black John Tyler students walked out of school amid conflict over perceived racial inequities in cheerleader elections. School officials came down hard, banning all walkout participants from re-entering the school until they and their parents submitted to interrogations by school officials. Black parents filed a federal lawsuit to get their kids back in school, and Judge Justice ordered that the students be allowed to return immediately. Soon after, the Justice Department recommended that Judge Justice follow the example of other Southern school desegregation cases and create an advisory committee, with both black and white members, to address community concerns and come up with ways of preventing racial discrimination in Tyler schools. Justice’s order mandated that eight members of the committee would be nominated by the school board and another eight by the group of black parents who had brought the cheerleader lawsuit. He instructed members to develop “ways and means of achieving interracial harmony and understanding among students, teachers and patrons.” The committee was also tasked with reviewing “all areas of school operation” relevant to desegregation, including investigating any complaints, and to advise the school board of their findings. The judge added a warning for school officials: his court would give “substantial weight to the findings and conclusions of the biracial committee,” not only in the John Tyler cheerleader dispute but in “resolving further problems” in the district. In October, a delegation of black Lee students asked again. They gave the school board a petition seeking changes in Lee’s name and its symbols. This time, the board referred the request to Judge Justice’s biracial committee. Meanwhile, tensions at Lee were reaching a flash point. In November, fighting broke out between black and white students after a group of white students chanted provocative cheers and sang ‘Dixie’ in the school courtyard. A black student tossed gravel at the white students, and another black student allegedly threw a punch. More than a third of the student body stayed away from school the next day. There were more confrontations. Some white students waved Rebel flags and bellowed ‘Dixie’ during a morning pep rally. Some blacks raised clenched fists during the national anthem and waved scraps of a tattered Confederate flag. The chairman seemed to be asking how far ought his committee go into territory the school board was unwilling to enter. Judge Justice issued a new order strengthening Tyler’s biracial committee; from now on, the group wouldn’t simply advise the school board. It would be an agent of Justice’s court, and the school board would be under court order to cooperate fully as the committee reviewed complaints and concerns about desegregation and racial discrimination in Tyler schools. The committee chairman promptly resigned. In a letter to the judge, he wrote that his chief reason for quitting was that he believed the committee’s recommendations would “not be favorably received by the majority of residents in the Tyler School District area or the present Board of Trustees.” Within four years after quitting the biracial committee, that businessman would be instrumental in founding one of Tyler’s oldest and wealthiest private schools. In early January 1972, representatives of the Texas Education Agency, or TEA, arrived in Tyler with a warning for TISD officials. As part of his sweeping statewide desegregation ruling, Judge Justice had ordered the TEA to enforce his rulings banning school symbols that might be considered discriminatory or upsetting to racial harmony. At the time, Confederate symbols were everywhere at Lee. The school mascot was a Confederate soldier. The school band, decked in stars and bars, would play ‘Dixie’ as students waved rebel flags from the bleachers. The drill team was named the Rebelettes. The school’s Rebel Guard, seniors in authentic Confederate artillery uniforms, fired a replica of a 19th-century cannon named “Ole Spirit” every time the football team scored. A month earlier, TEA had visited with Tyler school officials and told them that change had to come very soon for Lee’s symbols. Since then, the agency had gotten a formal complaint from someone in Tyler; that meant the district could find itself back in Judge Justice’s courtroom. If the district wanted to avoid more problems from the judge and the loss of accreditation and state funding, TEA officials warned, all of Lee’s Confederate symbols had to go. The next day, school board members voted 5-2 to remove Lee’s Rebel mascot, Confederate flags, the ‘Dixie’ fight song, Rebelettes drill team, and other Confederate symbols. Local newspapers reported that the entire board voted that Robert E. Lee High School’s name would stay. Following this decision, local newspaper accounts reported that some white students cried and others ranted, and other students silently watched as teachers stripped the school of Rebel flags, figurines, and mascots. The non-vote on the name change received only a terse mention in the newspaper, and no mention at all in a Tyler school district chronology documenting events of integration in Tyler schools from 1955 to 1973. That document did note that board members wanted to appeal Judge Justice’s biracial committee order all the way to the U.S. Supreme Court, and that the district would have to pay $2,207.50 for the off-duty policemen who patrolled Lee High School for those tense days in November. For instance, the parents wrote, they had asked the committee months earlier to look into complaints that ‘Dixie’ was still being played by Lee’s school band. “We have not heard from the committee,” the parents wrote. “We do not know whether the committee deems this unimportant.” Both students and the black community needed assurance that their complaints would be taken seriously, the black parents wrote. They had ongoing concerns about fairness in the selection of drum majors and majorettes, about possible disparities in dress codes and corporal punishment and about the banning of personal items such as hair picks. Black students weren’t allowed to pick their own representatives, they wrote, and were too small a minority to be able to elect the people they preferred for class offices or honors. Black students who were allowed to represent the school on a 20-member biracial committee didn’t necessarily voice the views of the majority of their black peers. “Black students needed to choose their own representatives, they wrote, because “we know who can best represent the black viewpoint. “We need ten people chosen in a hurry to represent our viewpoint,” they said at the end of their manifesto. “The pressure which the black students feel affects their attitude towards study and towards school attendance itself. The atmosphere here is oppressive. Many of the black seniors here would like to see some rapid improvement before they leave, for their brothers and sisters will be forced to come to this school. This thing is far from over. Some changes for the better need to come fast.” The bottom line: the students wrote: “This school should be closed and reorganized.” Though the document was kept in Judge Justice’s files, his papers include no responses from him or anyone else. There is no record of black students or parents, or anyone else, publicly bringing up the name issue at Lee again through formal channels. Fighting between black and white students continued at the school, often on days when Rebel flags were flown by whites, and parents kept raising concerns that black students were being disproportionately punished simply for being black. More letters were written, more complaints filed. The biracial committee kept meeting until the late 1990s, when Judge Justice left Tyler. In ensuing years, the committee would take up the question of how John Tyler selected its drum majors and how Robert E. Lee selected its Southern Belles drill team, and how both schools disciplined and suspended blacks. In time, the committee’s work quietly faded. 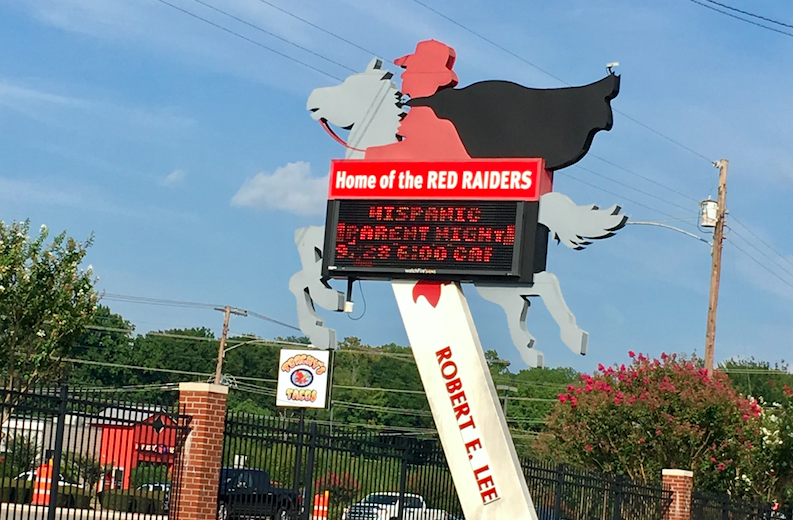 As evidenced by last month’s school board meeting, many Tylerites, even old timers, don’t know that this isn’t the first time there’s been serious opposition to the name of Robert E. Lee High School, or the first time change-resistant Tylerites have anxiously wondered, “Where does it end?” A look back at what happened the first time reveals how fraught, lengthy, and complex such a process can be. It also suggests that if Tyler does not resolve this issue this time around, there’s a good chance we’ll have this same emotionally charged discussion again down the road. History does tend to repeat itself that way.